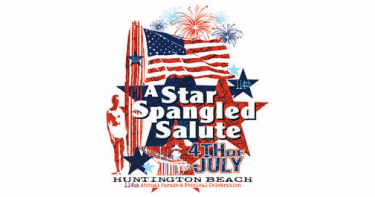 For a parade map, and more details about the full day of events, visit the Huntington Beach website here. From all of us here at Support Orange County, we wish you a happy and safe Independence Day! Beginning Friday, June 29th the Sawdust Art & Craft Festival will return to Laguna Beach! For over 50 years Orange County residents have visited this unique event each summer. Spread out over a 3-acre eucalyptus grove you’ll find a hand built village that features fine art and craft from over 200 local artists! Are you looking for events in Orange County that will really get your blood pumping? If so, we’ve got your fix! The upcoming Monster Jam in Anaheim will feature high octane entertainment and intense competition between several of the most recognizable trucks in the world. Thanks to a blower that forces air and fuel into their engines, these Monster Trucks all generate approximately 1,500 horsepower. To ensure safety while riding these mechanical beasts, the driver’s compartment is a steel safety structure mounted directly to the truck frame. Drivers also wear flame-resistant driving suits, gloves, shoes, and helmets—just in case. Some competitions will also feature special vehicles such as ATVs (all-terrain vehicles) and Speedsters. ATVs are race-modified off-roading machines built for performance, while Speedsters possess optimum agility that makes them perfect for maneuvering over rough terrain and around obstacles. Many of the Monster Jam events start with a pre-show Pit Party, which gives fans the opportunity to meet the drivers and get autographs or pictures. These Pit Parties do require a separate admission ticket, but the experience of seeing these vehicles up close and the additional activities appropriate for all ages is definitely worth it. After opening ceremonies conclude, the competition kicks off with several signature events. These include timed racing, head to head racing and freestyle performances. A panel of audience members selected as judges will assign a point value to each performance, and the points awarded for each competition will be tallied to determine an event champion. 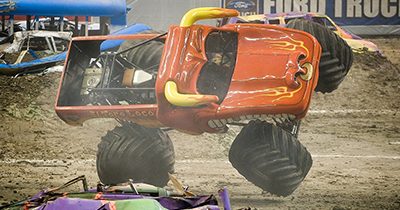 Monster Jam drivers are constantly challenging each other to create amazing spectacles to wow the audience and judges. Some of the tricks and stunts you can expect to see include backflips, wheelies, big air launches and cyclones—the familiar donut’s high-speed big brother. One of the best things about Monster Jam is that its drivers come from all walks of life and are united by the desire to put on the best show possible. There is even a “Monster Jam University” in Illinois, which offers training programs and practical experience in every challenge new Monster Jam drivers will face. Needless to say, Monster Jam is truly one of the best events in Orange County to satisfy any thrill-seeker. We hope to see you there for some word class four-wheel action! 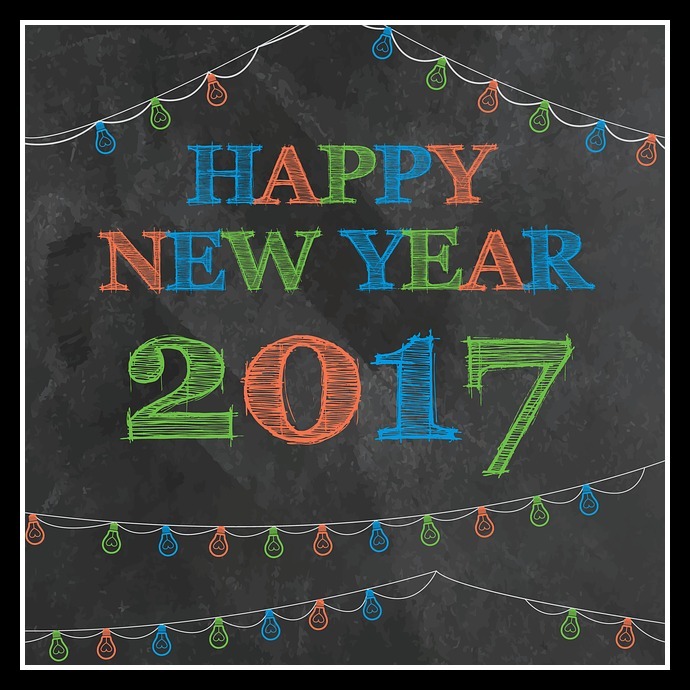 2016 is rapidly coming to an end, and it’s time to celebrate the beginning of a new year! Orange County offers several amazing New Year’s Eve events, ranging from free and family friendly options to extravagant parties filled with drinks and dancing. If you’re still looking for ideas on how to ring in 2017, check out our list below for some inspiration. Cheers! Fullerton will be celebrating the 25th annual “First Night Fullerton” event as a family-friendly alternative to traditional New Year’s Eve celebrations. This popular alcohol-free event receives around 15,000 guests each year, and will take place in downtown Fullerton on Harbor Blvd., Pomona Ave., and Wilshire Ave. “First Night Fullerton” will feature musical performances, food vendors, zip lining and rides, and a spectacular midnight fireworks show to ring in the New Year. Free parking is available at Fullerton College parking lots, located off of Lemon and Chapman Avenues in downtown Fullerton, as well as several other city lots within walking distance. The event begins at 7:00 pm and ends at midnight. Admission is free and open to the public. Knott’s Berry Farm is one of Orange County’s most popular places for families and friends to celebrate on New Year’s Eve. This year’s event will feature a midnight fireworks spectacular, as well as live music, DJ’s, and stage performances. Don’t forget to catch some thrills on the dozens of rides and roller coasters before the night is over! Knott’s Berry Farm is located at 8039 Beach Blvd., Buena Park 90620. The New Year’s event is included in the price of admission to the park, which opens at 10:00 am and closes at 1:00 pm.Tickets start at $42 for kids and seniors, and go up from there. Save money by purchasing your tickets online ahead of time! Time Nightclub, previously known as Sutra, will be throwing a supercharged New Year’s Eve party that is sure to cater to both Orange County’s stylish elite and dedicated local club-goers. Acclaimed DJ Steven Wright will be spinning top 40, hip-hop and mash ups while guests enjoy the 7,000 feet of dancing space, state of the art lighting system, and a complimentary champagne toast at midnight. Orange County’s most exciting club experience is located at 1875 Newport Boulevard, Costa Mesa 92627. The party starts at 9:00 pm and concludes at 2:00 am.Tickets begin at $59, and increase depending on your choice of VIP and/or group tickets. The 6th annual OC Midnight Kiss New Year’s Party is an amazing local celebration that’s perfect for couples and friends to spend their last few hours of 2016. Enjoy an open bar featuring Tito’s Vodka for four hours with general admission tickets, and a premium open bar all night for VIP’s. Top 40 house and hip-hop DJ’s will be spinning your favorite hits, so make sure to wear your dancing shoes! The OC Midnight Kiss NYE party is located at the Wyndham Irvine at 17941 Von Karmen Ave, Irvine 92614. The party starts at 9:00 pm on Saturday and continues until 2:00 am.Tickets are available here and begin at $105 per person, and increase depending on your choice of VIP tickets, group and/or hotel packages. This year, celebrate New Year’s Eve in style aboard one of Newport’s most elegant luxury yachts. “The Ambassador” is 140 feet long and features three levels, outdoor decks, a lounge and a dance floor. This four hour cruise through Newport Harbor is hosting a premium open bar all night, complete with an appetizer buffet, champagne upon arrival, party favors, and a special countdown to midnight. The yacht will be waiting for you at 2901 W. Coast Hwy, Newport Beach 92663. Check-in begins at 8:30 pm, and the boat will board at 9:00 pm and return at 1:00 am. Don’t be late! Ticket prices begin at $159, and have sold out for 13 years in a row so get them ASAP! 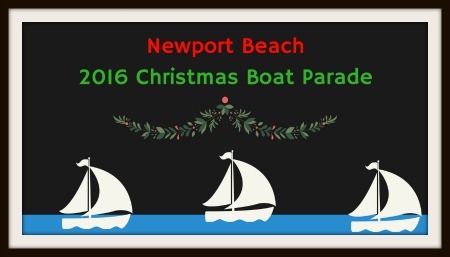 108th Annual Newport Beach Christmas Boat Parade This Weekend! The holidays are officially in full swing, and Orange County residents know that enjoying the festivities with friends and family doesn’t get much better than the annual Newport Beach Christmas Boat Parade! The 2016 Newport Beach Christmas Boat Parade and Ring of Lights will run December 14th through Sunday, December 18th. The parade begins at 6:30 pm each evening off of Bay Island, and ends at approximately 9:00 pm. Fireworks will also be featured from the Balboa Pier around 6:15 pm on Wednesday and around 9 pm on Sunday. The Newport Beach Christmas Boat Parade cruises through Newport Harbor, which stretches around the Balboa Peninsula, located off of Newport Blvd. There will be plenty of parking available in all city parking lots, as well as several opportunities for street parking along the parade route. Since the parade draws thousands of viewers every night, please allow extra travel time to find parking! The parade is a free event for the community and tourists to enjoy. The Balboa Village, aka home of the Fun Zone, is a great place to watch. There are also plenty of bars, restaurants, and kid-friendly activities nearby. However, for those who prefer a more intimate setting, watching the parade aboard a boat charter or in a waterfront restaurant is also highly recommended. Considering the popularity of the event, booking your reservations as early as possible is definitely encouraged. The Newport Sea Base lawn is also a great place to join in on the fun of the boat parade. Located at 1931 W. Coast Highway, this site features reserved chair seating and food and beverages available for purchase from Sea Scouts. The non-refundable tickets are $10 per person in advance and $20 at the door if space is available. Onsite parking is $20 car and is only available with a prepaid parking pass. The parade will take place rain or shine. However, if the Coast Guard issues a small watercraft advisory notice, the parade would be cancelled for that evening. The decision will be made by 6 pm each night and a message will be posted on the parade website in the rare case of a cancellation. All registered boats and homes compete for a number of awards, ranging from best theme, best music, and most humorous. Winners and the public are all invited to the Awards Dinner and Auction on January 27, 2017 at the Island Hotel Newport Beach to celebrate and raise funds for next year’s parade. 2016 marks the 108th year for the parade, which makes it one of the oldest running holiday traditions in the country. Nearly one million viewers enjoy the parade each year! The parade is proudly organized by the Newport Beach Chamber of Commerce and hosted by the Commodores Club. For more information on viewing, local hotel accommodations and more please visit the parade website. We hope to see you there to enjoy the sights and sounds of the holiday season! With so many things to be grateful for at each and every Thanksgiving, it’s incredibly important to remember those who are not as fortunate as we are. 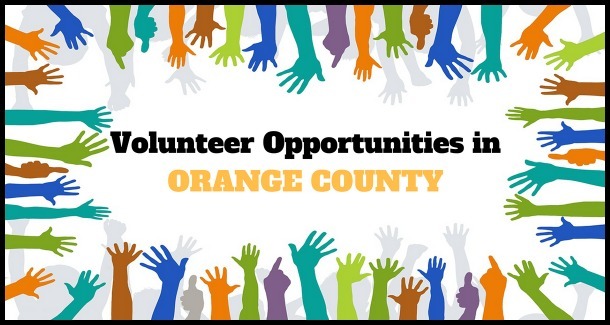 Extending a helping hand is an important part of sharing the holiday spirit with your fellow Orange County residents, so we’ve put together a list of 5 food banks in Orange County that always need volunteer help. These incredible organizations do amazing work in our community every day, and so we hope that if you have time or resources to donate, this list inspires you to do just that. The Orange County Food Bank works with almost 400 local charities and organizations in an aim to end hunger and malnutrition in Orange County. Annually, the OC Food Bank distributes nearly 20 million pounds of food and commodities to non-profit agencies in Orange County that serve low-income families and individuals. A few of their programs include the Food for Seniors Program, Farm 2 Family, and an Emergency Food and Shelter Program. The Second Harvest Food Bank of Orange County is a member of Feeding America, and works through a network of hundreds of non-profit partner programs to provide wholesome food and fresh produce to millions of hungry children, seniors and families in Orange County each year. Since 1983, their mission has been to end hunger in Orange County by combating the hunger gap and providing food for all who need it. The Friendly Center is a family and community resource center dedicated to improving the lives of low-income children and families by providing more than 20 free programs and services through its 6 locations in Orange County. The Friendly Center was established in 1924, and aims to help families overcome the barriers that keep them from making positive change in their lives. Families Forward is a non-profit organization that is committed to helping Orange County families who are homeless or at risk of becoming homeless. Their mission is to help families achieve and maintain self-sufficiency through food, counseling, education, housing, and other support services. The Southwest Community Center has been serving the low income residents of Orange County for over 35 years. Their mission is to provide the basic needs of clothing, food, shelter, transportation, and health and professional support services to all who need it. The Southwest Community Center also does adopt-a-family holiday programs and toy drives, the success of which was featured in the OC Register in 2012. 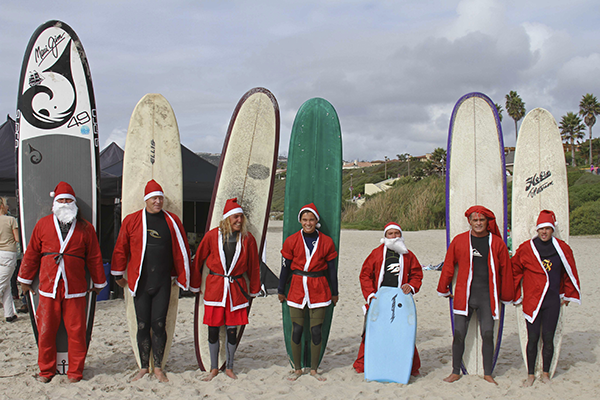 Surfing Santa Charity Event This Saturday! 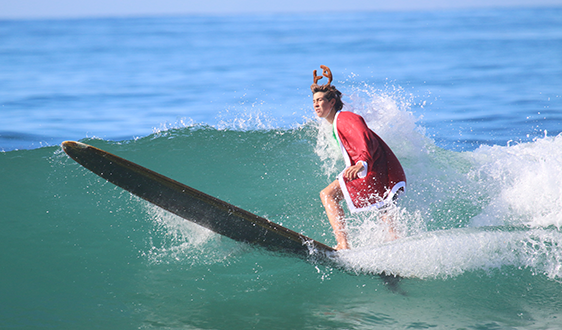 Surfing Santa is an annual one-day surf contest where competitors hit the waves dressed as Santa or any other holiday-inspired characters. Children of all ages and adults are welcome to compete to win some awesome prizes given to the top six surfers in five different divisions. Prizes include Maui Jim sunglasses, Carver skateboards, Surfline memberships, and many other items donated by local surf and active wear retailers. Additionally, the participant who wins the award for Best Costume will receive $500, and the winner of Biggest Air over the course of the day will receive a Brawner Board and $1,000! The concept for the competition was developed in 2009 by Ritz-Carlton, Laguna Niguel’s General Manager Bruce Brainerd to honor the resort’s commitment to supporting worthy causes. The five-star resort will also host an annual Surfboard Auction that kicks off the same day, and closes at noon on December 31, 2016. The collection of donated surfboards will be auctioned online, and over the years has highlighted boards from well-known artists and musicians, as well as personal boards donated from local surf legends. The Ritz-Carlton has proudly raised more than $210,000 for Surfers Healing since the inception of the Surfing Santa contest and Surfboard Auction. Surfers Healing is a foundation that hosts surf camps to share the therapeutic effects of surfing with autistic children and their families. Founders Izzy and Danielle Paskowitz have a personal dedication to the cause because when their autistic son Isaiah struggled with sensory overload meltdowns, surfing with his dad always calmed him down. After seeing the initial success surfing had on Isaiah, the Paskowitz family invited others to join them. Their idea caught on, and Surfers Healing has now become a grassroots non-profit organization that proudly hosts nationwide free surf camps and events for autistic children. We hope to see you this Saturday at Salt Creek Beach to help support the families and surfers that come together each year to make a difference, one ride at a time. Get ready to laugh out loud, because Aries Spears will be at the Brea Improv all weekend! Best known for his impersonations, Spears joined the cast of FOX’s MADtv in 1997, and quickly became one of the show’s standout talents. Some of Spears’ better known impressions include: Shaquille O’neal, Denzel Washington, Jay Z, Snoop Dogg and literally dozens more! You may have also seen him in Jerry Maguire, Malcolm X, and Josie and the Pussycats. The best part? The Brea Improv just released a promo code for $5 tickets!! Use the code DFBK5FOR5 upon checkout to receive your discount. Visit http://brea.improv.com/ to get your tickets now! 2nd Annual SoCal VegFest is This Weekend! If you love delicious plant-based food, yoga and meditation, rescue animals, Halloween costume contests, or just free and fun things to do, then you’re in luck! 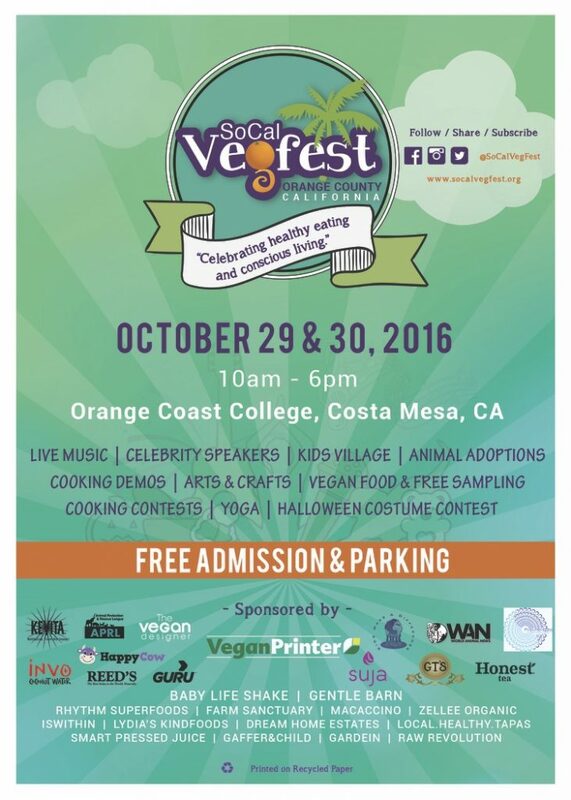 The 2nd Annual SoCal VegFest is taking place this weekend at Orange Coast College! SoCal VegFest is presented by the local nonprofit APRL (Animal Protection and Rescue League), and is proudly run by a 100% volunteer staff. The festival is meant to engage curiosity about vegan/vegetarian lifestyles and to inspire and support anyone who is interested in learning about living a more healthy, environmentally friendly and compassionate life. This one of a kind event will include free plant-based food samplings, vegetarian and vegan cooking demonstrations and contests, and several food trucks and vendors. Once you’ve had your fill of snacks, check out the cruelty-free marketplace for a truly incredible array of bath and body products, as well as amazing home goods. Kids of all ages and adults are also welcome to participate in the Halloween Costume Contest! The 2016 theme is “We love animals”, but prizes will also be given out in the “Adorable” and “Spooky” costume category. Little ones can also romp around in the Kids Village while enjoying engaging activities meant just for children. Make sure to check out the Main Stage and Speaker’s Hall to hear from the dozens of speakers and organizations who will be presenting on all things plant based over the course of the weekend. There’s also a plethora of information available about other local vegetarian/vegan events after this weekend’s festival. With all the interactive booths, musical entertainment, and raffles there truly is something for everyone! Although all of the vendors and SoCal VegFest staff love animals, there are no pets allowed due to venue and health department restrictions. However, if you’re looking to add a new four-legged friend to your family, SoCal VegFest will have an adoption area for you to check out some rescue animals in need of a loving home! Celebrate heathy eating and conscious living with other like-minded Orange County residents this Saturday and Sunday between 10am and 6pm. Admission and parking is free, and SoCal VegFest will go on rain or shine! We hope to see you there! Aviation enthusiasts rejoice: The Breitling Huntington Beach Airshow will be flying over Huntington Beach this weekend! Headlining this exciting event will be the United States Air Force Flight Demonstration Squadron, made up of the Thunderbirds and the Breitling Jet team. Flight demonstrations will take off with a rehearsal day on Friday October 21st, and on Saturday and Sunday official flights will begin around noon and will conclude around 4 pm. Surf City visitors will be able to view the free show along the coastline from Brookhurst Street all the way to the Huntington Beach Pier. The show’s center will be located at Beach Boulevard and Pacific Coast Highway, between Huntington State Beach and Huntington City Beach. A VIP admission area will also be available at the show center, featuring upgraded seats for premium viewing, food vendor options, and more! Ticketed areas will be open from 10 am- 5 pm on all three days, but early arrival is highly recommended. Tickets and more information are available on the Breitling Airshow’s website. Parking will be crowded, especially on the street, so various parking garages will be set up in downtown Huntington Beach. Additionally, GOGROUND is offering offsite parking at Goldenwest and Ellis Avenue with shuttle service to the event for $40 per car. Reservations are required and can be made here. The viewing area will be located on the sand at the beach, so make sure to bring all of your usual beach gear: towels, chairs, umbrellas, sunscreen and water! Food vendors will also be available throughout the area, and if you would like to bring your own food make sure that any barbecues are at least 18 inches high and are used within 6 feet of a fire pit. Beach regulations do not allow dogs, glass, alcohol, drugs, or firearms. Additionally, the entire show has been deemed a No-Drone Zone, and all those entering the show area are subject to search by local authorities. 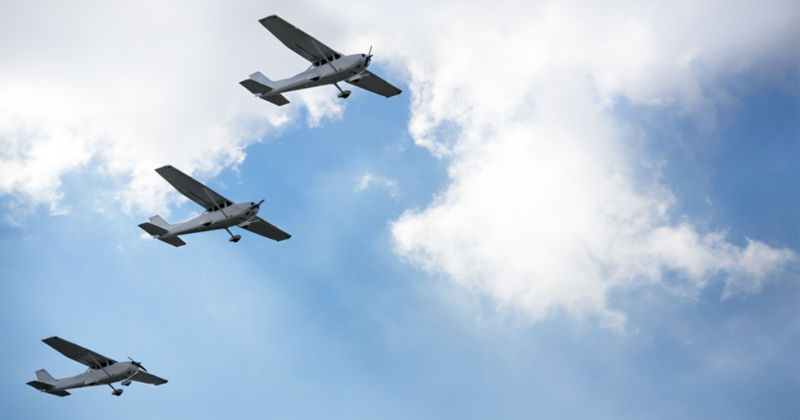 Cameras and binoculars are allowed, and due to the close proximity of the aircraft during the show those with sensitive hearing and young children may want to bring hearing protection. The proceeds of this inspiring community event will go the Aerospace Education Foundation of Huntington Beach, a local non-profit organization dedicated to empowering youth to pioneer the next generation of aviation. So what are you waiting for? Dig out your summer clothes and bring your family and friends to enjoy a spectacular day on the Pacific Ocean and some incredible acrobatic aviation performances! We hope to see you there! Tucked away unsuspectingly in Orange County’s famous Tustin Market Place is one of the most depraved haunted experiences that you can find anywhere. 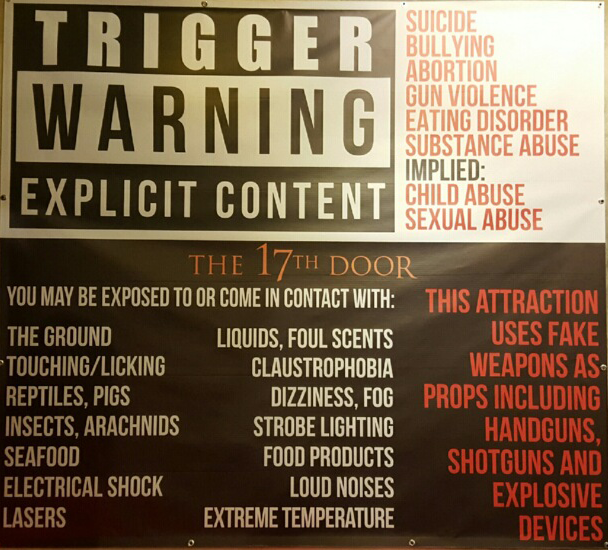 Now in its second year, The 17th Door boasts over 34 minutes of psychological terror as you work your way through 21 different rooms that promise to assault all 5 of your senses. Patrons can expect to experience claustrophobia, foul odors, and electric shock in addition to the multitude of pig demons, deranged clowns and undead entities that you’ll interact with throughout the experience. The haunt follows the story of Paula, a college sophomore who has recently survived a suicide attempt and subsequent stint in a mental ward. Paula is struggling to pursue her dwindling dream of becoming a doctor due to a painful traumatic pregnancy, and frequent psychiatric evaluations that force her to revisit disturbing memories from her childhood. It’s important to note that The 17th Door is not for the faint of heart. Prior to admission to Gluttire University, all patrons will be required to sign a waiver that outlines all of the different things you might be exposed to inside the attraction; including touching/licking, liquid, dizziness reptiles, fish and arachnids. For more information, please visit their FAQ page or contact them directly at (714) 441-9080. The Tustin Market Place has plenty of free parking. Located right off the 5 Freeway, exit Jamboree. Directly next door to Party City. The 2016 Orange County International Auto Show is currently under way at the Anaheim convention center, and will run until this Sunday, October 9. This year’s convention will feature over 600 of the newest cars, trucks and SUV’s all in one location! Although the convention just began, this year’s show is stacking up to be one of the most exciting yet. Below we’ve included general information about the show, as well as highlights of the main attractions. We hope to see you there! Tickets are $12 for Adults & $10 for Senior Citizens and Military. Children 12 & under get in free when accompanied by a paying adult. Onsite parking is available for $15, or attendees can take advantage of the free parking and shuttle at Angel Stadium. Visit the OCIAS website for more information. It wouldn’t be an auto show without a wide selection of high-end exotic vehicles from manufacturers such as Bentley, Lamborghini, Maserati, Porsche, Ferarri, McLaren and more. The Orange County International Auto Show has been billed as “SoCal’s greatest auto experience”, and this year should be no different. Attendees travel to the Orange County Auto Show from all over the country to get a glimpse of these rare vehicles. While it’s unlikely that anyone at the auto show is going to toss you the keys to a Lambo’ to take for a spin, several auto manufacturers will be offering the opportunity to get up close and personal with their vehicles. This year’s auto show attendees will have their choice of over 100 vehicles to test drive from manufacturers like Honda, Kia, Ford, Toyota, Chevrolet and more! 2016 OC Auto Show Attendees will receive a free subscription to Motor Trend Magazine. As if hundreds of captivating automobiles wasn’t good enough, the Orange County International Auto Show will also feature 4 of the best food trucks that Orange County has to offer. Burger Monster offers mouthwatering hamburgers that boast fresh ingredients and hand formed patties for an optimal burger experience. Next on the list is the Kala Truck which offers traditional Mexican food with artful dishes and top-quality classic ingredients. Additionally, the Coconut Truck offers craft sandwiches and was named 2015’s Best Food Truck in Orange County by OC Weekly. Lastly, the Tasting Spoon, headed by Chopped champion Joe Youkhan, has a vast array of gourmet options ranging from salads and wraps to burgers and artisanal pizzas. Fall is finally upon us, and there’s no better way to kick off the season than with beer and bratwurst! First and most importantly, it wouldn’t be Oktoberfest without a wide selection of authentic German beers. OldWorld Village imports brands like Hofbrau, Spaten, Dunkel, Warsteiner and more! Dozens of women audition each year with hopes of becoming one of OldWorld’s famous Oktoberfest Shot Girls. Also referred to as “Oktoberfest Babes”, these servers don traditional lederhosen while serving ice cold drinks and hot food! Among the job skills needed to be in this elite group: speed, agility, approachability and the ability to flawlessly execute the chicken dance. Oktoberfest 2016 features music from 4 different German bands that will be performing festival and dance music throughout the celebration. With names like Stuwwelpeter, The Alpine Sextet, German American Brass Band, and Treppensteiger, you can be sure that this is the most authentic “Oom Pah Pah” music you’ll find in Orange County. Alas, not all of the fun at Oktoberfest is intended for adults 21 years of age and older! 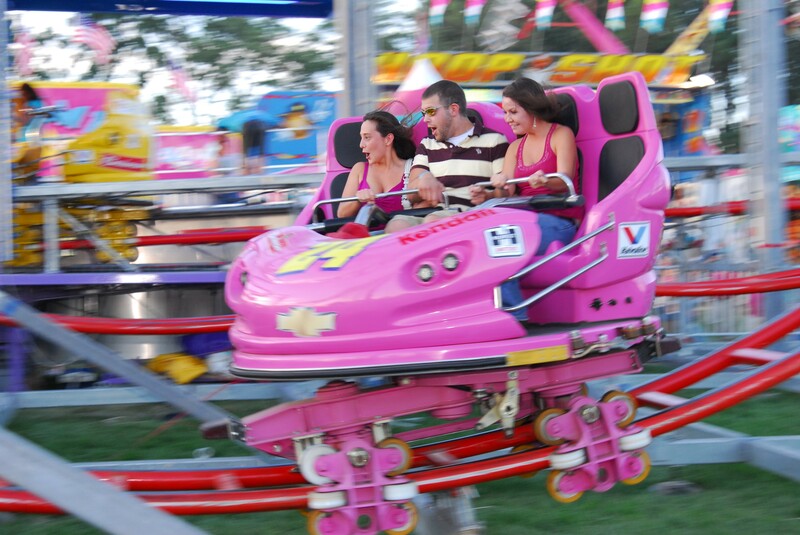 Kinderfest is held every Sunday during Oktoberfest between 2PM – 7:30PM. Your little ones will enjoy carnival games, face painting, chicken dancing and a bouncy house. Don’t miss out on the Happy Hallowiener kid’s costume party on October 30th! Last, but certainly not least, you can catch the dachshund races or “running of the wieners” every Sunday from 3PM – 4PM during Oktoberfest. After being placed into one of four weight classes, the dachshunds run a 22 yard course. At the finish line of the course, you’ll find a line of pet owners trying to lure their wiener dogs to the end zone with treats and toys. Admission during Oktoberfest is $7 for adults, $3 for kids, and children under 5 are granted free admission. You won’t want to miss this! National Public Lands Day is Tomorrow! Want to visit a national park, monument, or forest without paying to get in? Then grab your hiking boots and head out tomorrow (Saturday, September 24th) for National Public Lands Day! This annual day of service allows visitors to check out the beauty of California’s national parks and monuments for free. Incidentally, this year also marks the 100th anniversary of the National Park Service, so there’s no better time to get outside and enjoy the view! Check out our list of the top 5 parks we’d love to visit this weekend to plan your adventure. We’ll see you on the trails! Yosemite– Yosemite National park features nearly 1,200 square miles in which visitors can enjoy camping and hiking through deep valleys, ancient sequoias, glorious meadows, vast wilderness, and much more.This expansive park is home to thousands of wildlife and plant species, and virtually every visitor falls in love with Yosemite Falls, which at 2,425 feet ranks as the tallest waterfall in North America. If you have time to make the 315 mile journey from Los Angeles to Yosemite National Park, it promises to be an adventure you’ll never forget! Joshua Tree-The Mojave and the Colorado desert both collide just east of Palm Springs to create the stunning Joshua Tree National Park. The picturesque park known for its unique Joshua trees is a relatively short drive outside of Orange County, making it an easy day or weekend trip. Adventure sports enthusiasts are sure to love the world class rock climbing and mountain biking Joshua Tree offers. Naturalists also flock to this local Southern California retreat for the bird watching, horseback riding, wildflower viewing, and stargazing. Sequoia and Kings Canyon– These dramatic national parks lie side by side in the southern Sierra Nevada mountain range, and range in elevation from 1300 feet to nearly 15,000 above sea level! Discover the underground world of Sequoia National Park on a tour of a marble cavern, or take a guided horseback tour through the foothills of Kings Canyon.Overnight camping and backpacking is the most popular activity here, but rock climbers and photographers will also have plenty to keep them busy! San Francisco Maritime– A visit to this National Historical Park is more like a journey back in time. Located in the Fisherman’s Wharf neighborhood, San Francisco Maritime National Historical Park offers visitors incredible sights of historic ships and the chance to cruise San Francisco Bay aboard the 1891 National Landmark scow schooner Alma! Make sure to check out the area’s incredible history at The Maritime Museum and soak in all the beauty of the Aquatic Park Cove and Beach. Muir Woods– This redwood lover’s paradise is actually a California National Monument, as well as a part of the Golden Gate National Recreation Area. Besides the incredible array of flora and fauna, Muir Woods is also known for its rich cultural history. Indeed, in May 1945 United Nations delegates that were meeting in San Francisco traveled to Muir Woods to honor the late President Franklin D. Roosevelt with a special memorial. Free Museum Day in Orange County! If you’ve been lacking a bit of imagination in your day to day routines recently, we have your remedy! Plan ahead for some inspiring fun and mark your calendar for the annual Museum Day Live! event sponsored by Smithsonian magazine. On Saturday, September 24th you and a guest can enjoy free admission to any of the several participating museums and historical sites. Although Museum Day Live! is actually a nationwide event, there are several outstanding options in Orange County that are participating. All you have to do to sign up in advance is enter your email address and download your two free tickets to the museum of your choice. To help you get started, we’ve put together a list of three of the most amazing museums in Orange County that you can visit for free on Museum Day Live! Laguna Art Museum– This gorgeous museum is unique because it collects, cares for, and exhibits works exclusively done by California artists or containing subject matter that represents the culture of our beloved Golden State. The stunning cultural center was built in 1929, and after being used as a gallery for several decades became the Laguna Beach Museum of Art in 1972. Today, the museum showcases works from its collection, special exhibits, and several rotating fantastic events including artist talks, concerts, family days, and more! Make sure to take advantage of the current exhibits’ last few days and check out the dozens of incredible pieces by the undeniably talented Peter Krasnow, as well renowned photographer Anthony Friedkin’s The Wave Portfolio. Heritage Museum of Orange County– The breathtaking cultural and natural history center in Santa Ana covers nearly 12 acres in all. The centerpiece of the museum is a historic plaza of extensive floral gardens and citrus groves that feature several buildings from the 1890’s. Among those is the Kellogg House, one of the most popular field trip destinations for students in Orange County for over 30 years, which showcases what daily life was like in the late 19th century. Take a stroll down some of the easily accessed walking trails to find a fully operational blacksmith shop as well as a newly added traditional produce farm maintained by local high school and college students. The natural beauty and unique charm found here has made this museum a highly sought after wedding venue, and regularly hosts outstanding educational tours and events. Catalina Island Museum– Although technically located within Los Angeles County, we just had to include the fabulous Catalina Island Museum on our list. This museum, founded in 1953, just opened a brand new state-of-the-art building in the heart of Avalon that has to be seen to be believed. The Catalina Island Museum also boasts the first museum exhibition in California dedicated to the iconic “Queen of Pinups”— Bettie Page. Also on display, of course, is a permanent exhibit of hundreds of artifacts and photographs that bring to the life the rich history of Santa Catalina. Make this a weekend trip to remember by taking advantage of some of the other fantastic leisure and adventure activities that the island offers before catching the ferry back home! Orange County has a rich historical and artistic culture, and we are so excited to have the opportunity to explore more of our local treasure troves! If you have questions, make sure to check out Museum Day Live!’s FAQ’s here. We hope to see you out and about! Tune Up At the SoCal World Guitar Show This Weekend! The OC Fair and Event Center in Costa Mesa will be alive with the sound of music this weekend with the highly celebrated return of the SoCal World Guitar Show! This bi-annual event attracts thousands of musical enthusiasts, vendors, and buyers from all over the world. Trust us, if you’re a music lover you definitely won’t want to miss out! Co-sponsored by Vintage Guitar magazine and Amigo Guitar Shows, this melodic event will showcase modern and vintage musical instruments and accessories, books, records, and much more! Some of the major exhibitors also include various highly-respected maintenance and service providers in the musical instrument industry. Amigo Guitar Shows are America’s oldest, biggest, and best consumer guitar events. Since the late 1970’s, Amigo events have put on over two hundred shows all across the country! The Amigos are well known for pioneering almost every innovation in the guitar show business, including producing the world’s largest consumer guitar event in Arlington, Texas. With all the industry professionals in tow, this weekend’s music event in Orange County is definitely one of the best opportunities we’ve ever seen to learn about the vintage and modern world of music. 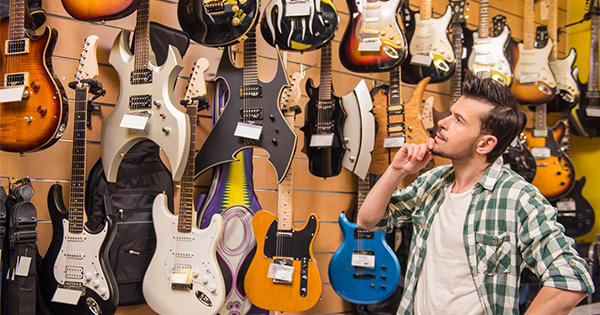 Visitors can expect to see everything from classic instruments like guitars, amps, banjos, violins, and drums to displays from manufacturers, retail stores, builders, and celebrities who attend the event. Attendees may also bring in any musical instruments, books, equipment, clothing, etc. to sell, trade, or have appraised at the show. Think of this rockin’ good time as a kind of musical swap meet! The SoCal World Guitar Show will be held this Saturday, August 27th and Sunday, August 28th at the OC Fair and Event Center, located at 88 Fair Drive in Costa Mesa. Admission is $20 for adults, and kids under eleven are free if accompanied by an adult. Show times run from 10 am to 5 pm on Saturday, and 10 am to 4 pm on Sunday. Even the most critical sound snob won’t be able to contain their excitement when they see the impressive array of instruments and music industry leaders at this weekend’s show. Grab your family and friends and come join in the harmonious fun! Whether you are looking for the perfect place to host a casual birthday party or the wedding venue of your dreams, our list of unique Orange County event venues has something sure to inspire! Lyon Air Museum: One of our favorite event venues in Orange County is located on the west side of John Wayne Airport in Santa Ana, and features a pristine collection of fully operational aircraft, vehicles, and memorabilia from the World War II era. The immaculately kept exhibits are a stunning backdrop for charity or corporate events, memorial services, galas, wedding receptions, anniversaries, and even fashion shows! 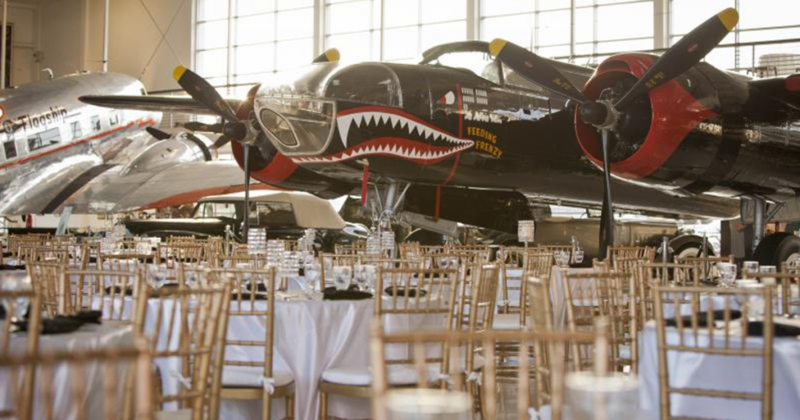 Lyon Air Museum’s 30,000 square foot hangar provides an intimate and historical event venue that is unlike anything your guests have ever seen before! The Grand Plaza Anaheim: This 100,000 square foot outdoor space located between the Hilton Anaheim and the Marriot Anaheim offers the perfect opportunity for thousands of guests to gather for year round events. The Anaheim Convention Center Grand Plaza is an ideal setting for alfresco dining receptions, concerts, exhibitions, meetings, and networking events. The convenient location and versatile outdoor space under the dazzling California sunshine make the Grand Plaza one of the most unique event venues in Orange County. Don the Beach Comber: Enjoy the spirit of Aloha at your next event in this 15,000 square foot Hawaiian themed restaurant. Don the Beach Comber features two large banquet rooms in the rear of the property that can be easily combined to host events. Intimate rooms for private anniversaries or birthdays are also available. Your guests are sure to enjoy the two waterfalls, hundreds of feet of bamboo, and exceptional Hawaiian Tapa wall art while sipping on handcrafted tropical cocktails. 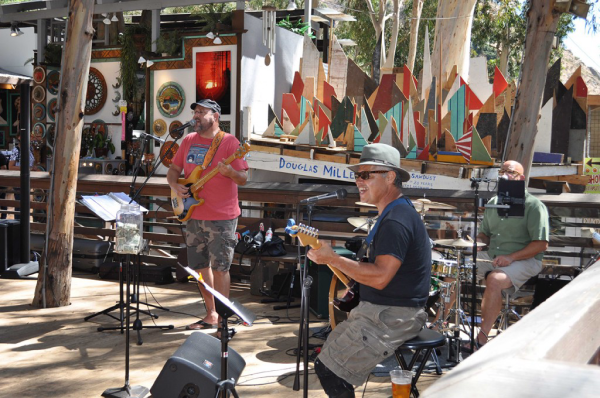 This Huntington Beach locale also regularly features local bands and themed live entertainment acts, so be sure to stop in for a festive Hawaiian retreat guaranteed to show you a great time! Seven-Degrees: For those seeking a truly spectacular experience, this simply stunning venue less than a mile from Laguna’s Main Beach offers a distinctive event space guaranteed to impress any crowd. The 25,000 square foot locale offers award winning architecture, extensive in-house design options, and several breakout rooms that provide an infinite number of unforgettable event opportunities. The lush gardens and succulent landscaping framed by the Laguna Beach canyons also create an unbelievably beautiful setting for outdoor weddings or events. The staff at Seven-Degrees prides themselves on artfully executing each tiny detail to create the celebration of your dreams! Discovery Cube: The Discovery Cube in Santa Ana is one of the most exciting and interactive event venues in Orange County, especially for families. This facility offers one-of-a-kind experiences for guests that combine learning and play, making it perfect for catered birthday parties, dances, and banquets. Permanent and traveling exhibits ignite the imagination of every visitor, and children especially love to engage with all of the amazing hands-on learning opportunities. Events at the Discovery Cube in Santa Ana are guaranteed to create amazing lifelong memories for guests of all ages! 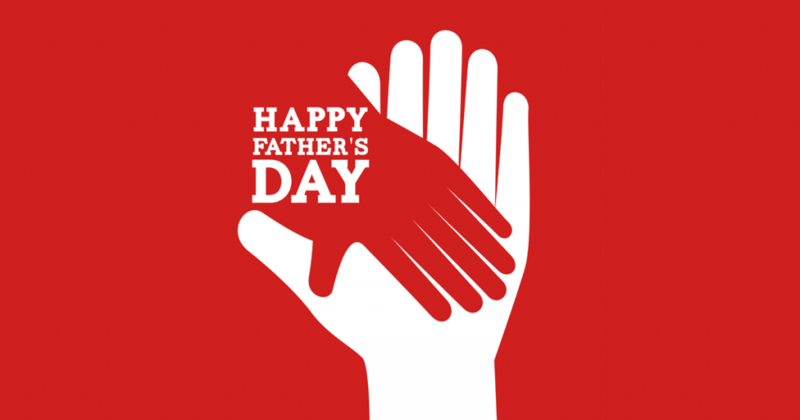 Fantastic Father’s Day Activities in Orange County! Dads sure have done a lot for us over the years. They’re always been there to help us with car trouble, take care of the lawn, kill bugs in the house, and, most importantly, to provide a great pillow to sleep on. They work hard, don’t ask for much, and are usually a good sport about doing the dishes. For all these reasons and many more, they deserve to have a great time this Father’s Day weekend! If you’re not sure how to treat the special Dad in your life this year, we’re helping you out with a quick list of some awesome Father’s Day events in Orange County that are simply too good to miss! This year’s classic car show produced by Flying Deuces will feature hundreds of unique automobiles, and is sure to be their largest event ever! Bring the entire family and treat your Dad to a world class car show with some of Southern California’s hottest vehicles! Dad will love checking out all the classic muscle cars, trucks, and exotics, and everyone will love the free general admission and live music. Downtown Brea also features dozens of restaurants, shops, and a nearby Edwards Theaters to entertain everyone for the whole day! Cruise on over to Birch Street and Brea Blvd this Sunday, June 19th, from 10 am to 4 pm for a great Father’s Day event with some of the most incredible cars we’ve ever seen! You’ll definitely blow Dad away this year by splurging on the belt loop defying All You Can Eat Father’s Day Sunday Brunch at Old World German Restaurant in Huntington Beach! The menu boasts American and European favorites such as BBQ ribs, pastas, a waffle bar, seafood, bratwurst, fresh fruit, imported cheeses and deli meats, and Old World’s famous apple streusels, just to name a few! Besides the unlimited champagne, Dad is sure to love sampling some traditional German beers, including a grapefruit infused Hefeweizen lovingly referred to as the “Beer-Mosa”. If your Dad is in the mood to soak up some sun and fresh ocean air this Saturday, June 18th, take him over to the 9th Annual Chili at the Beach event in downtown Huntington Beach! This tasty competition offers guests free admission and unlimited chili and salsa tasting tickets for just $10 if you purchase online, $15 at the event. Check out all of the vendors to find some fun activities or last minute gifts for Dad, and enjoy the live musical entertainment and roaming street performers! Let the kids run wild in the Kids’ Zone while Dad grazes and enjoys the day. Chili and salsa tastings are the main attraction for this event, so it’s recommended that you show up early to make sure you can sample as many as possible! Once you’re full up, end the day with a leisurely stroll on the Huntington Beach Pier, and don’t forget to snap a picture of you and Dad in the world famous scenery! Located in the SoCo Collection at 3315 Hyland Avenue, this is the place to spend a casual Saturday between 9 am and 2 pm. The market carries an impressive variety of fresh fruits, vegetables, nuts, honey, eggs, meat and poultry. Food trucks and handmade ice cream vendors are also usually in attendance to appease any hangry spouses or kids that need a snack. The SoCo Collection center is known as Costa Mesa’s “destination for inspiration” and offers up gorgeous stores that feature home décor, women’s fashion, and more. The adjacent OC Mix is also a great place to grab a cup of coffee, check out some artisanal cheese and olive oil shops, and bask in the glory of all the local boutique items you could ever desire. This Wednesday morning market runs every week from 8 am to 1 pm, and is believed to be the oldest farmers market in Orange County. 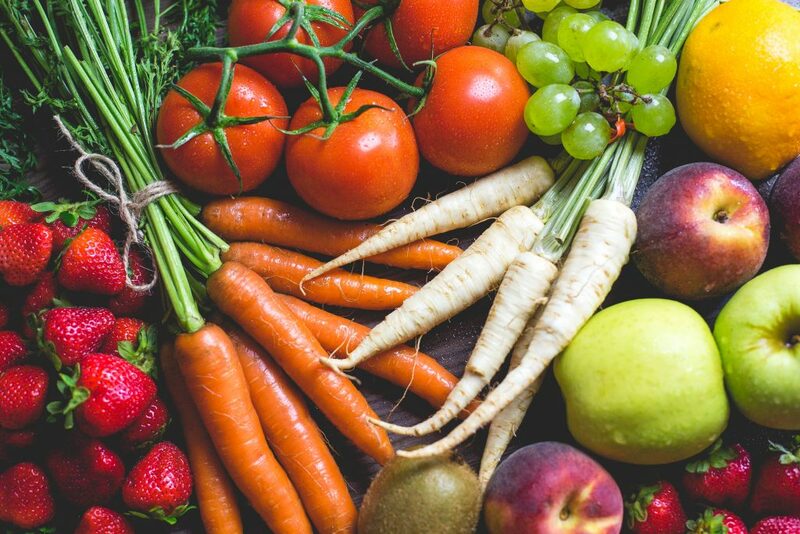 Located at Independence Park at 801 W. Valencia Drive, Fullerton’s favorite farmers market is famous for the fresh produce and extensive variety of fruits, vegetables, potted plants and flowers for sale. Many of the goods are brought exclusively to the market from vendors and farmers across the state, and cannot be found in neighborhood stores. Operated by the nonprofit Fullerton Certified Farmers Market Board, this market has many long-time customers that rely on it to fill their fridge each week. Every Sunday between 10 am and 2 pm, families flock to Irvine for the Great Park Certified Farmers Market located at 6950 Marine Way. This dog-friendly market features organically grown fruits and veggies from the Great Park Farm and other local farms, live entertainment, handmade artisan goods, and gourmet food trucks. The Farmers Market also features health clinics, nutritional seminars, and author meet-ups on a monthly basis. But the fun doesn’t stop there! Carousel rides are available for $2 each, and check out breathtaking views of Orange County for miles in every direction while soaring 400 feet above the ground in the Great Park Balloon. This extremely popular attraction is only $10 for adults and free for kids with an adult, but is run on a first come, first served basis. If your weekend plans are beach-centric, make sure you stop by the Newport Beach Pier on Sundays from 9 am to 2 pm to check out the unbelievable sights, sounds, and smells of the Newport Beach Farmers Market! This market features all the usual characters; locally grown produce, fresh baked breads, nuts, sauces, artisan goods, etc. What really sets this market apart (besides the ultimate Southern California beachfront scenery) is the famous Dory Fleet Fish Market just a few steps away. The freshest seafood imaginable has locals and visitors lining up as early as 5:30 am at this historical landmark. Everything you need to supply a feast fit for a king is waiting for you at the Newport Beach Farmers Market! This market is located in the quaint area of Old Town Tustin on the corner of 3rd Street and El Camino, and runs Wednesdays from 9 am to 1 pm. This popular farmers market has been going strong for over 20 years, and features locally grown produce, honey, bread, eggs, and plants. Grab some tamales or kettle corn to munch on while you shop for produce or peruse the crafty section stocked with unique, handmade items that make great gifts. Although this market is of a modest size in a busy downtown area of Tustin, the variety of goods is all-inclusive and free parking is easy to find. Note: All of our featured markets run all year and are also California Certified Farmers Markets. All Hail the Fish Fry Carnival! Costa Mesa is widely recognized as the heart of Orange County, and it’s no surprise with the plethora of restaurants, bars, shopping, outdoor activities, and close proximity to some of the best beaches in the state. 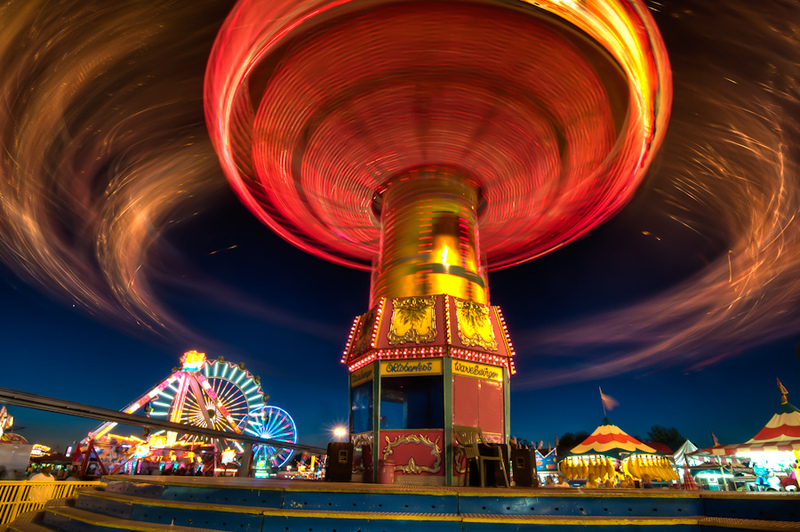 Community events for local Orange County residents are also an important part of the Costa Mesa culture, many of which are hosted on a weekly basis at the Orange County Fairgrounds. 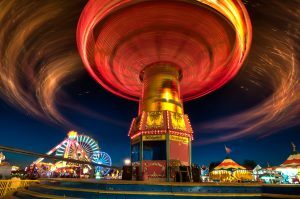 However, this weekend Costa Mesa’s Fairview Park is the place to be for the Costa Mesa- Newport Harbor Lions Club’s 69th annual Fish Fry & Carnival! Guests are invited to enjoy free admission to three days of music, carnival rides and games, local vendors, and, of course, the famous fish dinners! This family friendly event is also presenting a Battle of the Bands, the Fish Fry’s first annual Car Show, and the traditional Baby Contest! Each year, the Costa Mesa- Newport Harbor Lions Club hosts thousands of Orange County residents at their Fish Fry event to help raise money for local schools, clubs, and other community organizations. These Lions have been crowned “The Fish Fry Club” because of their fish-shaped hats and traditional fish fry recipe that goes back to the 1920’s. You definitely won’t want to miss out on the flaky, golden, perfectly battered fish! Swim on over to Fairview Park on Friday, June 3rd from 5:30-7:30 pm to check out local classic cars at the inaugural Car Show, sponsored by First Friday RoadShow. Stand-Up comedy by Lions Club member Bob Ooten and Friends will also be featured in the Beer Garden from 6:45-7:00pm and 7:45-8:00pm. The fish starts frying at 5 pm, and keeps on cooking until 9 pm! Over the course of the weekend, several local bands will be filling the air with a variety of music for guests to enjoy throughout the festivities. Lions Club members will continue the fish fry on Saturday and Sunday from 12pm-9pm, and with over 68 years of experience frying fish you definitely won’t want to miss out. Check out the Costa Mesa Fish Fry Facebook page to print out a coupon to receive $1 off your fish dinner at the event! Of course, the Lions Club asks that you only bring one per family since the Fish Fry is a non-profit event and every little bit helps! Sunday’s highlight is undoubtedly the annual Baby Contest, where parents can register their babies aged 6-24 months to win a number of categories including best personality, most beautiful and overall appearance. Of course, the judges are impartial and this is a light-hearted contest not to be taken too seriously. All of the adorable babies will be presented with some kind of a special award! Registration fees are $5 and interested parents should bring proof of birth date to register their baby. Outside of this weekend’s awesome Fish Fry fiesta, the park has also recently seen several improvements to the wetland habitats, including new dog-friendly walking paths and the planting of thousands of new plants, trees, and native shrubs. Families can visit every day before sundown to enjoy fun in the sun riding bikes, playing Frisbee, testing out remote controlled toys, or simply having a picnic. 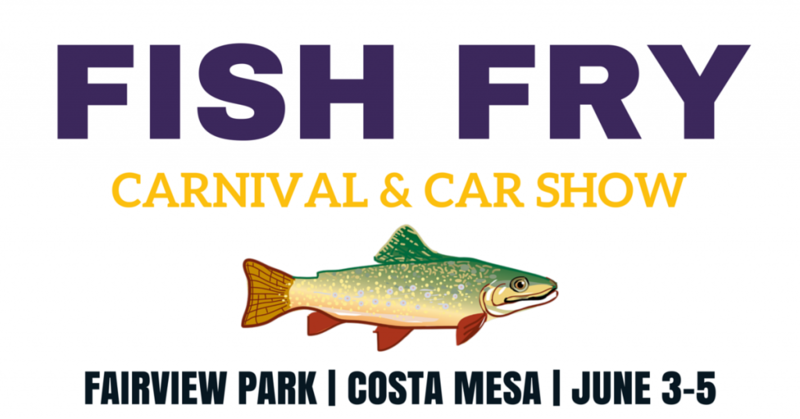 Join us this Friday, Saturday, and Sunday for one of Costa Mesa’s favorite summertime events where the fish will be frying and the sun will be shining! Fairview Park in Costa Mesa is located right next to Estancia High School at 2525 Placentia Avenue. We’ll see you there! The Garden Grove Strawberry Festival Is Back! Strawberries are a very special, delicious little piece of fruit that millions of people around the world begin to crave as soon as the weather starts to heat up. In fact, Americans eat an average of three and a half pounds of fresh strawberries each per year! Since California produces nearly 80% of the supply of our country’s strawberries, it’s only natural that we should celebrate these heart-shaped treats over Memorial Day weekend with the return of the beloved Garden Grove Strawberry Festival! The first Garden Grove Strawberry Festival was held in 1958, and was put together as a way to bring together the east and west sides of Garden Grove. The festival itself is a non-profit (501-c-3) organization that is separate from the City of Garden Grove, but has raised money for numerous city projects as well as the city’s police and fire departments. The Garden Grove Strawberry Festival has developed a rich history of giving back, and over the past 50 years over $5.5 million in proceeds has been donated to hundreds of local non-profits! The festival also treats over 2,000 special needs kids to a full day of free rides and food, and college scholarships to local outstanding students are also awarded each year! We’re definitely planning on kicking off the weekend by attending the Welcome and Strawberry Cake Cutting Ceremony on Friday at 6 pm, where free strawberry shortcake is served to all who attend! The world’s largest strawberry shortcake is cut by the Mayor of Garden Grove and has been reported to weigh as much as 500 pounds! Admission to the festival is free for everyone, and wristbands for unlimited rides all day can be purchased for $30 on Friday and $35 Saturday through Monday. 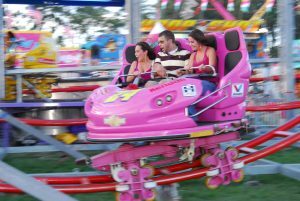 For many, these exciting rides are the highlight of our annual Strawberry Festival, and there are dozens of options guaranteed to delight everyone in your family! The festival also offers game booths, arts and crafts, and commercial booths. There are also several Strawberry themed events, including the annual Strawberry Stomp 5K Run that takes place early Saturday morning before the Festival Parade. Registered participants who participate in their best strawberry themed outfit will be given a chance to receive a one year membership to Chuze Fitness! Every finisher will receive a finisher medal when they cross the finish line and the top 3 male and female in selected age categories will also receive medals. Monday’s Redhead Roundup Contest is also sure to be a hit with categories like Strawberry Blond, Cutest, and Redhead with the Most Freckles! In the 1980’s the City of Garden Grove began broadcasting the festival parade on local TV stations, and this tradition still continues today. This year’s celebrities in attendance appearing in the parade on Saturday at 10 AM will include, but are not limited to, Miss California, Miss Garden Grove, several awarded actors and public personalities, multiple U.S. Olympians, and Snoopy! There will also be incredible live music and performances over the course of the weekend, including a Strawberry Idol Karaoke Contest! Join us for the annual fruit fiesta located at the Village Green in downtown Garden Grove that begins this Friday, May 27th at 1 pm and concludes Monday, May 30th at 10 pm. It’s one sweet way to celebrate Memorial Day Weekend with the whole family! 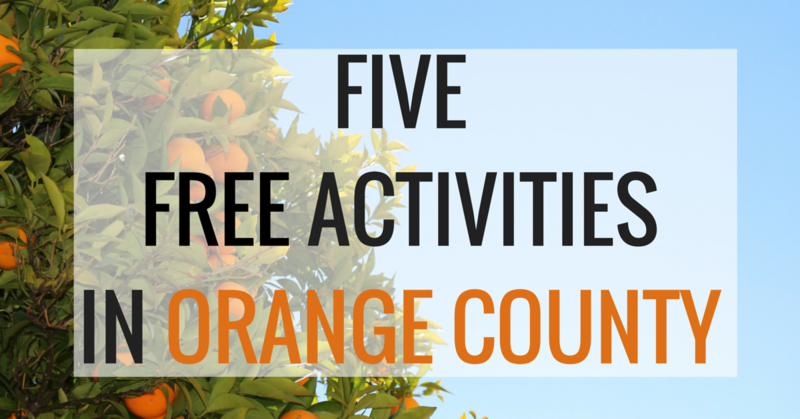 5 Upcoming Free Activities In Orange County! Orange County is an amazing place to live for so many reasons, but sometimes things can get a little pricey. For those who are looking to keep their budget in check this summer without missing out on all the fun, check out this latest list of upcoming free Orange County events to help get the ball rolling! This Saturday, May 21st, from 10:30 to 11:30 am the Muth Interpretive Center of Newport Beach is hosting an Explore the Bay Family Hike. Learn about Upper Newport Bay and enjoy its miles of beautiful trails on this easy hike. We advise you to bring a hat and water, and make sure you lather on some sunscreen before you hop out of the car. There’s no registration necessary, just head on down! Meet on the patio of the Muth Interpretive Center at the Upper Newport Bay Nature Preserve, located at 2301 University Drive in Newport Beach. Visit ocparks.com/parks/Newport or call 949-923-2290 for more information. Mark your calendar for Sunday, June 5th from 11 am to 4 pm for the ever popular annual fine arts and music festival presented by the Yorba Linda Arts Alliance! This incredible free, family friendly event will feature original works of art, photography, ceramics, glassblowing, wood working demonstrations, and children’s art activities. Explore the fine art, historical, and cultural exhibits while enjoying live entertainment, food trucks, and the beautiful outdoor park setting. The Yorba Linda Celebration of the Arts Festival will be held at Hurless Barton Park & Thomas Lasorda Jr. Field House, located at 4701 Casa Loma Ave. in Yorba Linda. Come and get your zen on (for free!) at the Cypress Library on Tuesday evenings (except the first Tuesday of the month) from 7 to 8 pm. This is a gentle, slow paced class designed to be approachable for yogis of all ages and skill levels. Wear comfortable clothing and socks, and bring a water bottle and yoga mat if you have one. You will be required to sign a waiver upon arrival. Guests should meet in the library’s Program Room, located at 5331 Orange Ave, Cypress. For more information, please call 714-826-0350. May the force be with you this Saturday, May 21st at the Yorba Linda Public Library’s “Star Wars Day”! All ages are welcome to attend, and the event runs from 10 am to 1 pm. Everyone in your family is sure to enjoy all of the themed crafts, games, a light saber demonstration, taking photos with their favorite Star Wars characters, and much more! We promise—this is not a trap! For more information, call the Yorba Linda Public Library at 714-777-2873 or visit at 18181 Imperial Highway in Yorba Linda. Join us in Old Town Tustin on Sunday, June 5th from 11 am to 5:30 pm for this free family friendly event! The street fair features craft booths, a kids carnival, live music and entertainment, and much more! Love spicy foods? Indulge in sampling dozens of chili concoctions, or try your hand at the chili pepper eating contest! There’s also a watermelon eating contest for those that can’t stand the heat. This event is located on El Camino Real and Main Street, and parking may be hectic so plan to head over early. For more information call (714) 573-3326. The OC Night Market Provides a Taste of Summer Fun! The OC Night Market is getting the summer season started by opening for the first of three weekend events, starting this Friday, May 13th! Festival goers will be celebrating the third year of the OC Night Market from 4pm-midnight at the Orange County Fairgrounds and Event Center, located at 88 Fair Drive in Costa Mesa, CA 92626. The OC Night Market is one of the largest food festivals in Orange County, and features over a hundred local food vendors and chefs! Since the OC Night Market is produced by 626 Night Market, the largest Asian-themed night market in the U.S., many of the food vendors also feature traditional and contemporary Asian fare, as well as the more familiar over-the-top fair cuisine. With all the incredible vendors and the sixteen food trucks to choose from, the OC Night Market is basically food heaven. We’re definitely looking forward to stopping by Norigami’s booth for the famous “Noritacos”, a mouth-watering combination of crispy seaweed tempura shells and fresh sushi-inspired fillings like spicy tuna, ahi poke, and soft shell crab. Thai Me Upp will be also be offering some feast-worthy Satay chicken wrapped with roti shell, peanut sauce, pickled cucumber and red onions. Grab a cold brew from the Kirin Ichiban beer lounge, and dinner is served! For those who are looking to satisfy their sweet tooth, Rolling Ice Creamery offers a one of a kind dessert experience straight from Thailand featuring customizable rolled ice cream made from scratch using a sub-zero temperature pan. Square Ice Cream is also offering its most popular calorie-fest of a dessert; a square donut filled with ice cream, topped with Fruity Pebbles and then drizzled with white chocolate. Yum!!!! The OC Night Market also aims to serve as a platform for local entrepreneurs, small businesses, artists and performers to connect to other like-minded individuals in the Orange County community. Over 50 non-food vendors will be selling unique homemade arts and crafts, jewelry, clothing, accessories, and bath and body products. The OC Night Market website has a full list of participating vendors for those who would like to research some of these amazing Orange County small businesses. At the Art Walk area, artists will showcase their talents in medium such as photography and spray paint, with many pieces for sale at the event as well. Festival goers are also invited to participate in the ever popular Chalk Art contest! Local DJ’s and several live music performers will keep the energy flowing throughout the jam packed event each night while guests mix and mingle on the dance floor. The OC Night Market is a great way to celebrate the return of glorious Southern California summer with your friends and entire family, and children 6 or under can enjoy free admission! General admission ticket prices are only $5, parking is $8, but both are cash only. ATM’s are available at the event, as are bike racks for local residents to avoid the parking fee. Join us this weekend at the OC Night Market for incredible food, creative arts and crafts, energizing dance and music performances, and much, much more! Cinco de Mayo has been celebrated each year since 1863 to commemorate the Mexican army’s unlikely victory over French troops at the Battle of Puebla. This victory established a sense of patriotism and unity among the Mexican people, and as many thousands of Mexican gold miners celebrated it effectively established May 5th as an important holiday in California’s history. 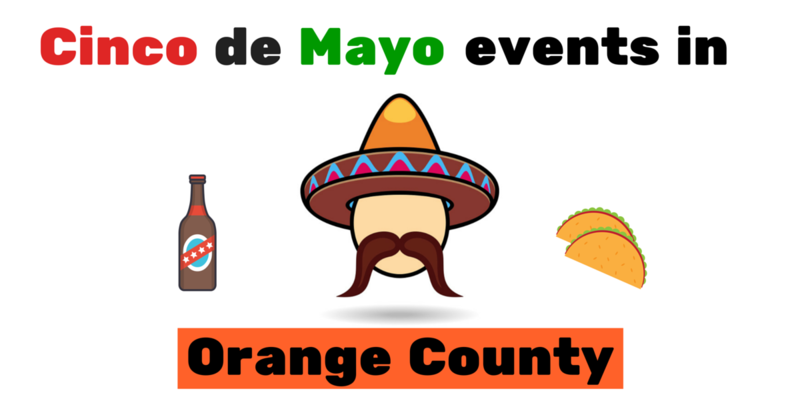 Since Cinco de Mayo is right around the corner, we’ve compiled a quick list of some festive Cinco de Mayo events throughout Orange County in order to help you celebrate Mexican culture and indulge in some traditional food and fun! Fullerton- Celebrate Cinco De Mayo with this free, family-friendly event at the Fullerton Market! The Fullerton Market is celebrating its 25th anniversary this year, and will be held each Thursday from April 7th through October 27th between 4 and 8:30pm. The Market features local food vendors, live music and entertainment, a farmer’s market with fresh locally grown fruits and vegetables, and handcrafted artisan goods. This Thursday, parents can enjoy an outdoor beer and wine garden while the kids have fun with Mexican crafts and activities at the Kids’ Korner, all while enjoying festive performers and live music by “La Sirena y Orquesta Mar de Ashe”. Irvine- The Cinco De Mayo Fiesta at Pretend City Children’s Museum will be a jalapeno-hopping good time for kids and their parents! Pretend City provides an interactive and educational environment for children, and this Thursday will be celebrating Mexican culture with some festive themed activities. Kids can learn about the history of piñatas while getting to create their own artful interpretation, engage in an interactive themed story time, and participate in the Jalapeno Hop dance party! Guests will also enjoy the music of Mama Lisa’s World and make a Mexican Dancing Doll to dance with to the music!There are no reservations required, and the price is included with museum admission. Santa Ana- Bowers Museum, located at 2002 N. Main Street in downtown Santa Ana, hosts a monthly Thirsty Thursday event every first Thursday of the month. This month’s festivities happen to fall on Cinco De Mayo, and the Bowers is going all out to celebrate! This Thursday enjoy happy hour drinks, live Mayan and Mexican music, a Diego Rivera inspired art workshop, and music and dancing in the courtyard! Included in the admission price of this event also includes a glass of champagne, and ticket prices vary from $10 for students and Santa Ana residents to $20-30 for museum members or general public. This event will be held at Bowers Museum from 5-11pm, and is for guests at least 18 or over. Costa Mesa– For those who are interested in attending a powerful cultural tribute to Mexico, The Segerstrom Center for the Arts in Costa Mesa will be hosting an incredible Cinco de Mayo event that is sure to make an impression! Grammy nominated Mariachi Sol de Mexico will be honoring the Mexican holiday with traditional and contemporary music, as well as original songs by the 13 member group. Before Mariachi Sol de Mexico takes the stage, concert goers can enjoy free activities starting around 6:30, set to include dancers, Jose Hernandez Academy students performing in the Arts plaza, and a performance by folk band Conjunto Tenocelomeh. Tickets range from $29-$89, and the show starts at 8:00 pm. Earth Day Events in Orange County! Earth Day is an incredible opportunity to bring people together to reflect on the importance of protecting our natural world. 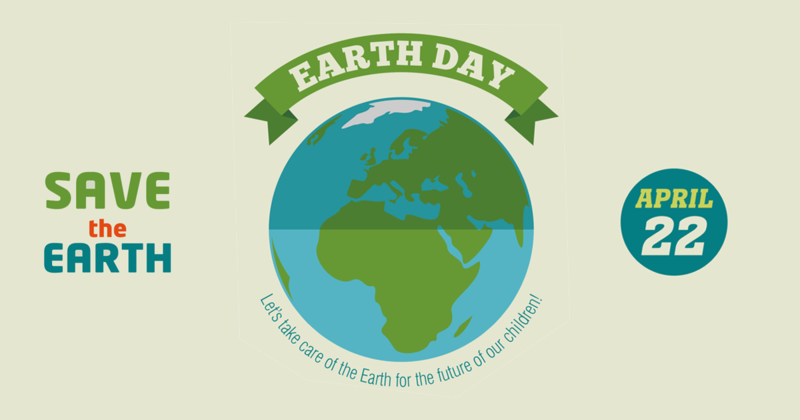 In fact, Earth Day is one of the largest international holidays, celebrated in 192 countries. This year will mark Earth Day’s 46th year of celebration since it’s creation by the Earth Day Network nonprofit. We’ve compiled a short list of some of our favorite Earth Day events in Orange County. They’re sure to inspire you to appreciate and care for the world around you every day! Come and celebrate Earth Day 2016 at this fantastic (and free!) all ages community event! The kids won’t be able to contain their enthusiasm with Earth Day themed crafts, a face painting booth, live animals, and scavenger hunt! Parents can also enjoy exhibits, food trucks, live music, and a screening of a Newport Beach Film Festival movie. Raffle tickets will be available for purchase for thousands of dollars worth of credit to local Orange County businesses. All proceeds from the ticket sales will benefit the Newport Bay Conservancy. The 26th annual “Earth Day at the Bay” will be held Saturday, April 23 from 10 am-3pm at the Muth Interpretive Center in Newport Beach. Cal State Fullerton’s Center for Sustainability will host a variety of events for all members of the community next Tuesday, Wednesday and Thursday on campus. Activities will include a farmer’s market, exhibits on green energy, sustainable transportation and a showcase on recycling and waste. The Fullerton Arboretum is also sponsoring Orange County’s first bioblitz. Parking will be available at the university, and Earth Week events will be held at a variety of times and locations on campus. Children of all ages and their grown-ups will learn about the Earth in an interactive environment at the Earth Day 2016 Celebration hosted by Irvine’s Pretend City! Engaging activities such as recyclable art projects, natural science experiments, and environmentally themed story time and art lessons will be featured. Pretend City employs an arsenal of trained educators to help guide you and your child. With the experienced staff and amazing activities, everyone is guaranteed to learn something new and have a great time along the way! This Earth Day event will be held Friday, April 22nd from 10am until 4pm, and is included in the price of admission. Habitat for Humanity of Orange County will be hosting a furniture re-painting DIY workshop for $35 per person. In addition to the workshop, there will also be a free electronic recycling drive from 9-6 at the Santa Ana ReStore. All proceeds will go toward funding affordable Habitat OC homes for under privileged families in O.C. This Earth Day Event in Orange County will be held on Saturday, April 23, 2016. Visit their website for more details. The Bolsa Chica Conservancy is a small non-profit organization that relies heavily on volunteers to help restore native habitats. They host a number of volunteer events each month focused on conservation and coastal clean up. Kids as young as 6 and adults of all ages are welcome to attend this month’s next clean up efforts on Saturday, April 30th to put their Earth Day thoughts into action! RSVP beforehand and make sure to slather on the sunscreen, wear closed toe shoes and bring a reusable water bottle. Time flies-or in this case-hops, when you’re having fun! This coming weekend is already Easter Sunday, and the beautiful Orange County weather begs for some extra entertainment fit for the whole family! 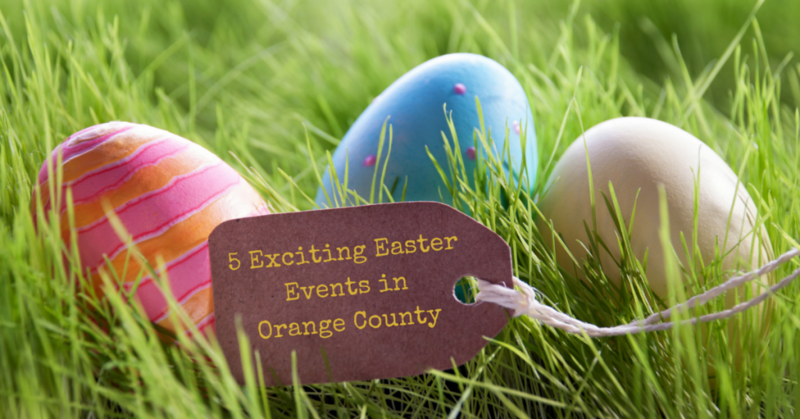 Luckily for those of who you are in need of some last minute plans, we’ve done the hunting for you and have compiled a basket-full of Easter events in Orange County that are sure to put a spring in your step. Bunny Train– Kids can go on egg hunts throughout the day at different times depending on age group. Baskets are available to buy at the park if you forgot yours at home! The event also offers a hayride, cookie decorating, games, and train rides, of course. Children can also show off those adorable spring outfits and get their photo taken with the Easter Bunny. The Easter Eggstravaganza will be hosted this Saturday, March 26th, at the Irvine Regional Park in Orange starting at 9:00 am. Farmer’s Market Spring Festival– Every Thursday the Anaheim Certified Farmers’ Market takes place, but this week is an extra special occasion. This Thursday, March 24th, the Market will host its annual Spring Festival, which appeals to kids and their parents. For the little ones the festival offers a special craft project and a free photo with the Easter Bunny, while the parents can enjoy all the usual goodies that the Market regularly has to offer. Tustin’s Easter Egg Hunt– This Saturday, March 26th, you’ll have no problems waking your kids up early. This egg hunt begins at 9 am sharp, but the fun doesn’t stop there! Among the other attractions offered at this free community event are inflatables, pony rides, games, a petting zoo and pictures with the Easter Bunny. Head on down to the Tustin Sports Park this Saturday morning for what is sure to be a bunny blast with your chickadees! Easter Eggstravaganza– Pile the kids into the car and head on down this Saturday, March 26th, Laguna Niguel’s Chaparosa Park for a sensational seasonal celebration. The morning’s activities will include fun inflatables, live entertainment, art projects, and energizing games for the whole family. Kids can get their faces painted and take their photo with the Easter Bunny, and parents can meet some of the Parks & Recreations class instructors as well. Rabbit Run 5K/ Egg Hunt- At this Saturday’s annual event at Jeffrey Trail Middle School, participants can enjoy some holiday fun while they run, walk, or hop their way through a 5K. There will be two races- the OC Challenge and the Easter-themed Rabbit Run, which is a 3.1 mile Easter egg hunt. The Easter Bunny waits for participants at the finish line, and prizes will be given for the winning runners. Strollers, bikes, and tricycles are allowed, but use at your own risk. We hope this list has helped some ideas bloom for you and your family to be able to enjoy a fantastic Easter holiday together! Don’t be shy and hop on over to one, or all, of these amazing Orange County events this weekend! Looking for Gourmet Food Trucks in Orange County?? Us too. And although you can find a few food trucks at local bowling alleys or business parks, you can always find Food Trucks at the Orange County Fairgrounds. That’s right, the OC Fairgrounds. Every Thursday food trucks are featured at the OC Fairgrounds. And they rotate too, so each week there is a different selection. From the Kogi Truck, the Lobsta Truck, the Barcelona truck, the Grilled Cheese Truck, and the Wiener truck. And for you vegetarians, there’s the SeaBirds Kitchen. They even have dessert trucks for that after lunch sweet tooth. Plus, the OC Fairgrounds has the Farmer’s Market right next door, so you can shop for some farm fresh food to take home for the weekend. There are usually between 5 and 10 trucks there every Thursday. So bring some cash, bring a friend, and bring your appetite, as there is a great selection of items on the lunch menu to choose from. If you’re tired of recycling the same ideas for this Father’s day or if that neck tie present is getting old, here is a chance to make some new memories. Whether your dad is a sports junkie or prefers an afternoon of wine tasting, there dozens of events this weekend in Orange County to keep your father entertained. If you were hoping to get dad that muscle car this year, but came up a little short, here is the next best thing. Each year the Brea Classic Car show draws more than 10,000 attendees to beautiful Downtown Brea. With more than 175 cars, Live music, free general admission and parking cruise down to the car show and indulge in some nostalgia. If you’re looking to spend some quality time with dad and help in his personal hygiene regimen, Pretend City’s Father’s Day celebration is guaranteed to help. Children and dads get to enjoy the magic of playing together. Participate in for “tie-rrific” art activities all day, join in the afternoon for the shaving cream race, as dads and children participate in a shaving contest, and don’t forget about story time. 4. Frisby Cellars Winery- Father’s Day Wine Tasting! If your father enjoys the finer things in life and is looking forward to a break from the grind, treat him to Frisby Cellars Winery& Tasting Room. Open 12-5 PM Saturday and 1-4 PM Sunday for tasting and wine gifts. Special Father’s Day discount on Tasting Flights for Dad. *Discount valid with purchase of one regular tasting. Finally, if your dad has a sports craving with his favorite team, take him out to the ball game. The Los Angeles Angels of Anaheim play the Arizona Diamondbacks at Angel Stadium. Friday there will be fireworks and live music in the garden and Sunday, fans receive a Father’s Day oven mitt and pot holder 7:05 p.m. June 15 and June 16; 12:35 p.m. June 17. Angel Stadium, 2000 E. Gene Autry Way, Anaheim. Friday Night Lights (FNL) Fall registration is now open in Orange County for Youth Flag Football and Cheer. There are 5 leagues in Orange County to choose from, and league expansion opportunities available. 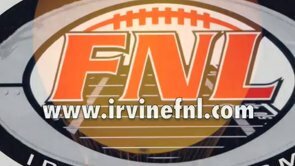 www.IrvineFNL.com includes Irvine, Tustin, Foothill Ranch, and Lake Forest. www.LosalFNL.com includes Los Alamitos, Seal Beach, Cypress, and Long Beach. www.GGFNL.com includes Garden Grove, Anaheim, Westminster, Stanton, and Buena Park. www.HBFNL.com includes Huntington Beach and Fountain Valley. 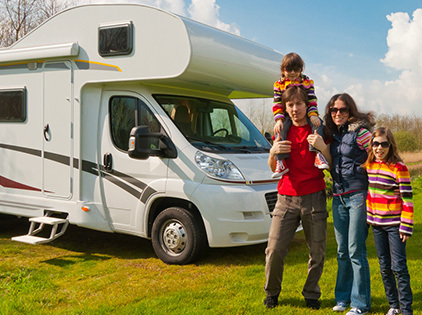 www.NewportMesaFNL.com includes Newport Beach, Costa Mesa, Santa Ana, and south HB. There are 5 divisions for boys and girls from Kindergarten to 8th grade. For more information call (562) 756-5307. IIDA Orange County NeoConnect 2013 – Connecting the Commercial Interior Design Industry to the Commercial Interiors Manufacturers and products! Get Engaged, Get Educated, Get Inspired. Discover the latest innovative products and resources for commercial interiors. Check out the New Cars slated for 2014 along with a slew of hybrids, bi-fuel, and prototype cars. Do you love gourmet food trucks? Well cruise on over to the Orange County Fairgrounds on Thursdays from 11:30 to 1:30 for your choice from about a dozen food trucks. The foods ranges from gourmet tacos and carnitas on fries, to lobster rolls. There’s Cajun, vegetarian, deep-fried, gourmet hot dogs, Mexican, Thai, pulled pork, and BBQ. Pull up a table and enjoy a few minutes of sunshine before you head back to the rat race. Or get it to go and at least have a nice lunch while working at your desk. And the best part is, many of the trucks rotate from place to place, so there is always something new to choose from. Check out this delicious crab roll from the Lobsta Truck. Yum! Adopt a pet at the 4th Annual Fall Pet Days at the Orange County Fair on Saturday November 2nd. Cost is $2 or get in free with an unopened can or bag of dog or cat food. Booths and fun for all ages. If you are a dog or cat lover in Orange County, this is the place to be. Please pass the word, maybe a friend or relative of yours could use the company of a dog or cat.